In photoelectrochemistry surface states play an important role in charge transfers. When that happens, work function of a sample is changed. 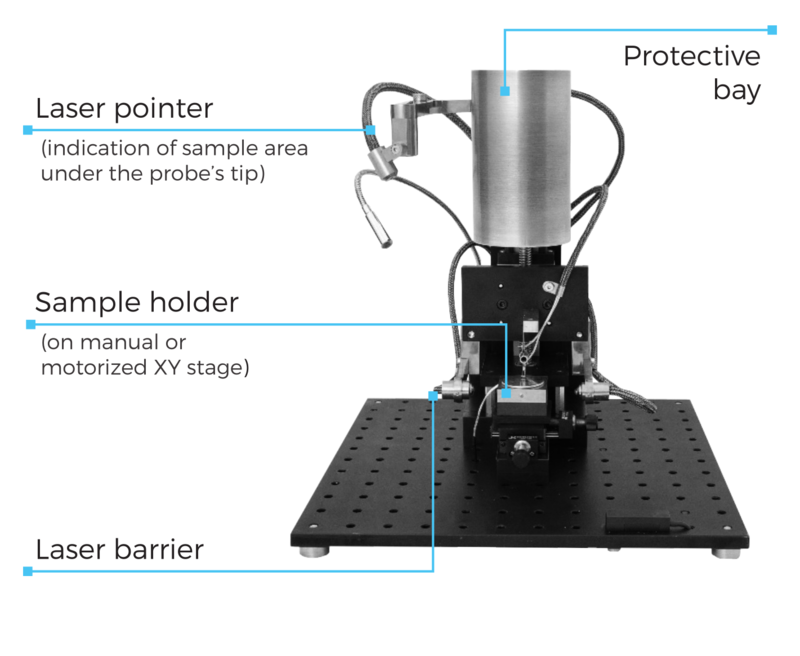 The Kelvin probe system allows precise measurement of work function of different semiconducting and conducting materials with high precision and accuracy. The non-contact measurement involves oscillating capacitor, one electrode of which is a specimen, the other is oscillating reference electrode made of gold grid. Thus, measured value is referenced to the workfunction of gold (5.1 eV). Resolution of the measurement can reach 0.1 meV with sufficiently long integration time. The Kelvin probe system can be used in various type of surface studies, including: corrosion, adsorption/desorption, surface charging, catalytic activity and others. For convenience, the probe is equipped with laser pointer and digital microscope. The motorized vertical positioning system allows reproducible of the reference electrode at the same distance from the specimen’s surface (with accuracy of 10 um). X-Y positioning can be installed as an option. 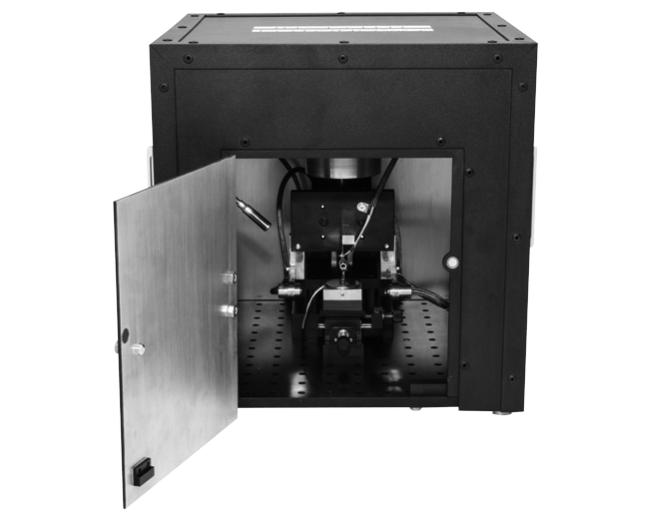 The system is also equipped with wide-band light guide that can be coupled with digitally-controlled monochromator and high pressure xenon arc lamp. 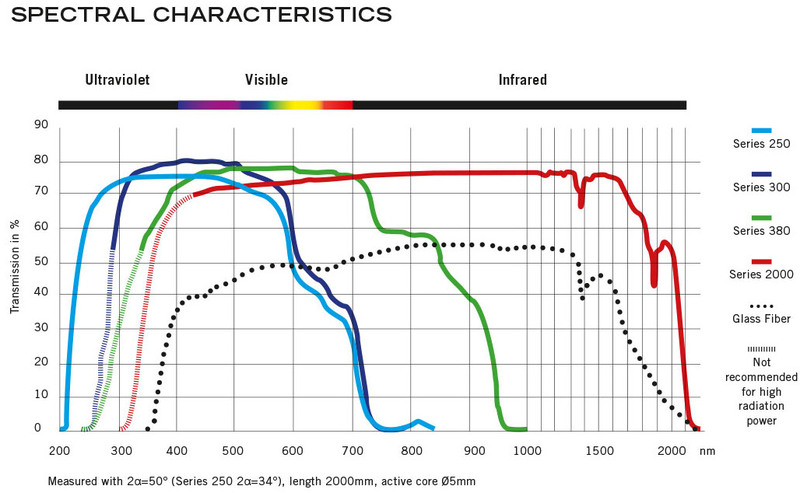 The wavelength range from 300 to 1000 nm can be used for continuous or pulsed sample illumination. This configuration allows measurement of the workfunction and electrical charging of surfaces, surface photovoltage spectroscopy and other photophysical techniques with photovoltage resolution better than 5 mV (0.1 mV when long integration time is applied). The whole system is accommodated in grounded Faraday cage for reduction of electrical noise and the influence of stray light. This surface photovoltage spectrometer is an essential tool in investigation of photocatalysts, organic and inorganic semiconductors, solar cells and other photoactive materials and devices. With the help of this Kelvin probe/surface photovoltage spectrometer monitoring of photocorrosion of semiconductors, photodesorption and photocatalytic reactions in real time is also possible. The device consists of an oscillating gold probe mounted on a firm stand with Z-axis motorized stage, electronic control units and a Faraday cage. A sample is placed on manual or motorized XY-stage with motion range of 1.5 cm in either direction. 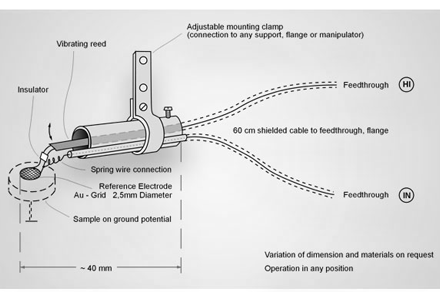 The probe is attached to a Z-stage that can place it at a desired distance from a sample. A red laser pointer shows place where the probe will oscillate over during measurement . A USB microscope and a white LED are helpful once the system is covered with a Faraday cage. Light is delivered to the sample with liquid waveguide or optic fiber, so the possible EM interference from a light source is eliminated. In idle run or during storage the fragile gold probe is homed into a protected space to prevent accidental damage. The system is also equipped with the automatic sample height sensor. Probe S from Besocke Delta Phi GmbH used in our Kelvin probe systems. The entire probe is covered with a Faraday cage, shielding it from the environment. The following result comes from prof. Radecka group (AGH, Cracow, Poland). 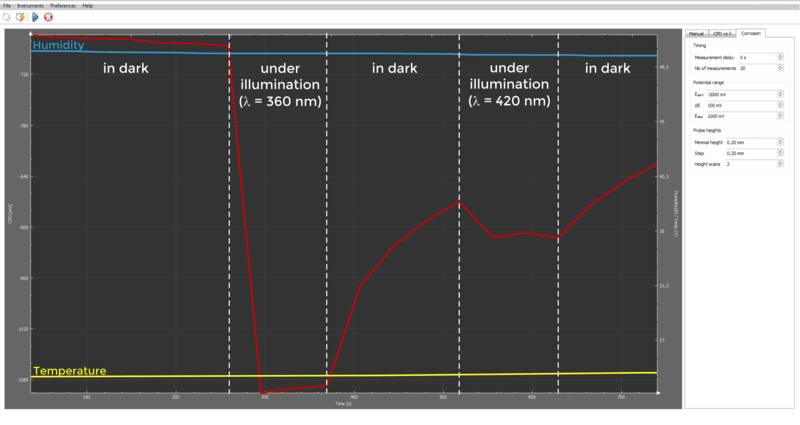 The surface photovoltage spectrum of an antase sample. Photovoltage is measured as a variation of the surface potential on pulsed illumination vs. gold grid reference electrode. Since measurements are performed in ambient air, the instrument records the air humidity and temperature. Those two parameters may affect the work function of a sample. Accessories It is recommended equipping this product with the following accessories. Select to include one in the valuation.